Bhakti Yoga literally means: "The yoga of devotion". This devotion referred to is our souls' inherent love of God, which we must re-awaken by this yoga process. 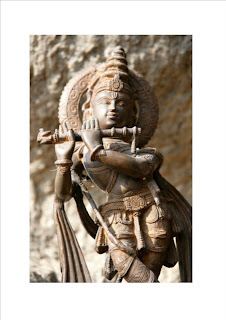 Some basic terminology: Bhakti: Devotion (to God). Krishna (Krsna): The Supreme personality of Godhead; His original form being that of a young and beautiful cowherd boy who plays the flute, although He has other forms in other expansions, such as Vishnu. Krishna appears with His female counterpart/ expansion, His "Hladini Sakti" or pleasure potency, Sri Radha. Vaisnava: one who worships Vishnu (Krishna) as the Supreme Personality of Godhead. Gaudiya Vaisnavas: Practitioners of Bhakti Yoga who acknowledge Caitanya Mahaprabu to be the Yuga-Avatara. They give special emphasis to the service of Radha both in order to please Krishna, and for Her own sake, as the Mistress of devotion to Krishna. Yuga Avatara: Avatar (incarnation) of God who appears on Earth in a particular age (yuga) in order to promote a particular way of performing bhakti that is appropriate to the time. Guru: the spiritual master. A real guru is one who has realised Krishna by the process of Bhakti Yoga and can show others the way. It is nothing to do with money or prestige, only love and trust. In Bhagavad Gita, Krishna tells us to seek out and take instruction from a genuine guru, serving him/her and treating him/her with respect. Of course, there are many bogus gurus in this world who may cheat us... Devotee: Someone who is practising Bhakti Yoga. Even someone who has just chanted "Krishna" once. Sannyasi: Someone who is in the renounced stage of life, and has formally taken a vow to give up everything not directly connected to bhakti, even home and family. A sannyasi has very few if any personal possessions, and traditionally relies on the charity of others for his bodily survival. In modern times, our Krishna Consciousness Movement sannyasis wear saffron robes and travel the world preaching. The Gaudiya Vaisnava sannyasis wear saffron cloth and carry a danda, which is a staff made from 3 sticks bound together- hence they are sometimes known as "Tridandi Sannyasis". Mantra: A repeated phrase used in prayer and meditation. The greatest of these is the Mahamantra: hare krsna hare krsna krsna krsna hare hare hare rama hare rama rama rama hare hare, which should be chanted as many times as possible on a daily basis, as the main practice of Bhakti Yoga for this current yuga. Lila: A pastime, or account of the divine activities of Radha and Krshna. Reading and reflecting on these pastimes forms an important part of awakening one's devotion to Radha-Krishna. Saddhana: One's daily practice of Bhakti Yoga, involving amogst other things) chanting Mahamantra and any other mantras given by the guru, hearing about Krishna from the scriptures, remembering Krishna's pastimes, prayer and serving Krishna in deity form at home or in a temple. Sanskrit: Ancient language using Deva Nagari script (like modern-day Hindi) in which the Vedas were written, and which is the original language of the demigods; these beings, (for example, Lord Brahma, Lord Shiva) are devotees of the Lord, who inhabit a higher realm but can - and do- visit Earth. Many Indo-European languages have vocabulary in common with Sanskrit. Sampradaya: lineage or disciplic succession of spiritual masters; there are 4 main Vaisnava sampradayas; Sri (founded by Ramanujacarya), Brahma (founded by Madhvacarya), Nimbarka (founded by the Four Kumaras with Nimbarka as acarya) and Rudra (founded by Vishnuswami) . Gaudiya Vaisnavas belong to the Brahma-Madhava sampradaya. Mayavada philosophy and Bhakti Yoga- differences: Promoted by Sankaracarya, Mayavada is probably the antithesis of Bhakti Yoga, as it propounds that God is formless effulgence, and that the ultimate aim is to merge with that light. 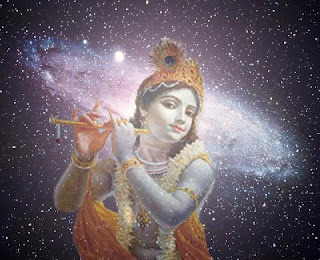 In Bhakti Yoga, however, one's devotion to Krishna via spiritual practice leads ultimately to the discovery of one's soul's inherent "rasa" towards Krishna. (This will fall into one of five categories; neutrality, servitude, friendship, parental or loving sweetness.) On the death of the physical body, the soul will then no longer need to incarnate on Earth and will take on a form appropriate to its rasa to serve Krishna eternally in the spiritual world. A soul usually transmigrates millions of times through different life-forms until a human birth is achieved in which the process of Bhakti Yoga can begin. The gopis of Vrndavana are the highest example of the worship of Sri Krsna. Krsna-prema is the fifth and highest goal of life. Scriptures: Bhakti Yoga is based on revealed scripture, or sastra; the actual word of God. These are the ancient Indian Vedas, also revered in Hinduism, such as Srimad Bhagavad Gita (part of Mahabharata), Srimad Bhagavatam, and the Puranas. Only the Vedic scriptures referring to personalist philosophy (as opposed to Brahma-Vadi/ Mayavadi ie: impersonalism, which states that we are all God and that God is formless) are considered sastra by devotees of Bhakti Yoga. The Vedas represent oral teachings from ages past which were written by incarnations of the Lord himself, such as Sri Vyasadeva, in order to remind people of their eternal duty. I can guarantee you that whatever difficult questions you may have about life, the universe and everything, there will be an answer in sastra. Everything is there, from how to conduct oneself in day-to-day life to technical explanations of how creation takes place. It will blow your mind! 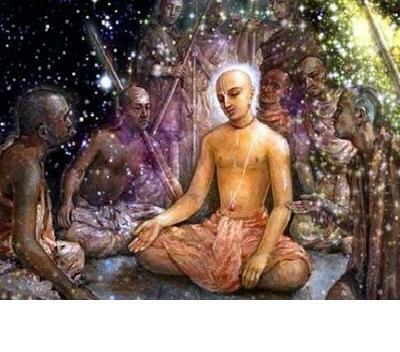 As well as the Vedas, there are more modern scriptures such as "Sri Caitanya Caritamrta" from the 17th century AD, concerning Caitanya Mahaprabhu, a relatively recent avatar of the Lord, and books written by elevated Vaisnavas such as the works of the Six Goswamis of Vrndavana or Bhaktivinode Thakura's "Jaiva Dharma" from the turn of the 20th century. These Vaisnavas are considered to be eternally liberated souls who manifested themselves upon the Earth only to help humankind. Roots: Although the Vedic teachings are ancient beyond measure (as you will see if you read Bhagavad Gita, in which Krishna explains where the teachings originally came from and to whom they were imparted down the ages) there have been long periods in world history in which the teachings have either become corrupted or forgotten altogether. During one such period, in 15th-century Bengal, Krishna incarnated to give humankind the true message of pure Bhakti once more, and to give us a method for realising God even in this Kali Yuga. The avatar is known by the name "Caitanya Mahaprabhu" or "Gauranga" ("The Golden-Limbed One") due to his noble stature and complexion. He appeared during a lunar eclipse of the new moon in March 1486 as the second son in a Vaisnava family in what is now Mayapur in West Bengal, north of Calcutta on the Ganges, but was then called Nadia. As He appeared to grow up, it was clear that He was not an ordinary person. He preached that we should chant Mahamantra (hare krsna hare krsna krsna krsna hare hare/ hare rama hare rama rama rama hare hare) as our main practice of Bhakti Yoga. He lived both as a married householder and a renounced sannyasi, both in West Bengal and Jagannath Puri, Orissa, thus providing an example to people in all walks of life of how to be Krishna Conscious. "The Kitchen Religion": That's what the "Hare Krishnas" were sometimes called when Bhakti Yoga first caught on in the West. So what has all this philosophy got to do with cooking? Devoting oneself to God means serving Him. Without this, we are not doing Bhakti Yoga. But we are in the material world, in material bodies...so how can we perform this service? In this current Age of Kali, where quarrel, sin and hypocrisy reign supreme and we are ravaged by disease and many other kinds of suffering, our lifespans and mental faculties are severely limited. 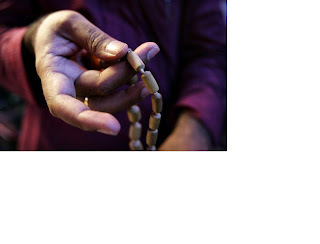 (People alive during a Satya Yuga live a lot longer, can go without food longer and can meditate for centuries!) We can serve God in our meditation, travelling "astrally" to the spiritual world, but it is very difficult. So Krishna has very kindly arranged to be present in any image of Him (like Krishna, Radha, Balarama, Lord Caitanya and Lord Nityananda) either as a picture or as a deity which appears to be made of stone, wood, clay, metal etc. THIS IS NOT IDOLATRY; WE ARE WORSHIPPING GOD DIRECTLY BECAUSE HE IS PRESENT! So Krishna is with us in tangible form, and we can then serve Him easily by providing food, water, clothes, flowers, incense, bathing Him, singing to Him, etc. and that's where the cooking comes in. We strive to prepare nice meals for God, just as you would for an honoured guest in your house. They are made only from ingredients in the Mode of Goodness, because that is what Krishna accepts. 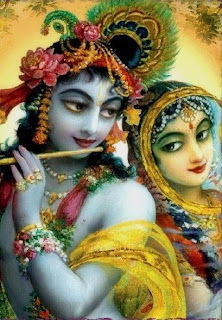 He does not need to eat, as He is the all-powerful Supreme Being, but He allows us to serve Him, and He wants to taste not really the food, but our blossoming love for Him. We offer all that we eat to Krishna, as an act of devotion. When Krishna has accepted this food, it becomes transformed; spiritualised. We call it "prasadam" or "mercy". when one takes only prasadam, one is said to have given up eating This prasadam has perceptibly different qualities to mundane food (or "bhoga"- "enjoyment") and not only does it nourish our bodies, but it brings us closer to Krishna by purifying our consciousness and deepening our connection with God. The Modern Movement of "Krishna Consciousness" A popular misconception is that the practice of Bhakti Yoga is a recent "invention"; a 1960s cult that arose in the US in the era of "Flower-Power". Those who know a very little more would say that it was "invented" by Srila AC Bhaktivedanta Swami Prabhupada. You may have seen his picture in the books the devotees give out in towns and cities across the world. While it is true that in New York and San Fransisco in the 60s many so-called "hippies" who were feeling very disenfranchised from Western values and the "American Dream" were atttracted to the teachings of "The Swami" (as Prabhpada was often referred to), doing Bhakti Yoga required that they should clean up their act, give up smoking, drugs and alcohol, become vegetarian, cut their hair and follow a strict regime of personal hygiene. In fact, Prabhpada once said that he was turning "Hippies into Happies"! Prabhupada did found the International Society for Krishna Consciousness (ISKCON), which gave people in Western countries temples and an institution to belong to, but he was actually only repeating the same message that comes down to us via revealed scripture. At first there were some minor concessions to help people adjust to the different way of life, but what Prabhupada preached was in essence no different from that which many people in the Indian subcontinent have been practising since time immemorial. "Krishna consciousness" means Bhakti Yoga. Prabhupada was already approaching old age when he arrived in New York in the late summer of 1965. He had come from Vrndavana, India, where as a member of the Gaudiya Math he had taken sannyasa (the renounced order) some years before and had been engaged in translating scriptures into English. It was the wish of his spiritual master, Srila Bhaktisiddhanta Saraswati Prabupada, that he should spread the message of Krishna consciousness all over the world, and he was helped by his dear godbrother Srila Bhaktivedanta Narayana Maharaja, both initially (he sent Prabhupada some Indian musical instruments) and after Prabhupada's departure from this world, by offering shelter and guidance to his disciples. Today, both ISKCON and the International Pure Bhakti Yoga Society number millions of devotees around the world.